Allyson Britton DiRocco defends the interests of both public and private employers in a variety of industries including health care, banking, education, and municipalities against claims of discrimination, retaliation, constitutional claims, contract disputes, misappropriation of employers’ property rights or business opportunities, restrictive covenants, and other aspects of employment relationships in both state and federal courts. Allyson also counsels employers concerning strategies for compliance with federal and state laws involving various aspects of employment law aimed at the prevention of claims. 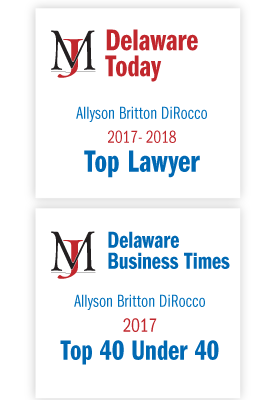 Allyson advises private and public institutions regarding matters such as benefits, employment, social media and privacy issues, and student/parent issues. Allyson frequently serves as a guest speaker on employment and education law topics. Obtained an order granting summary judgment on behalf of the City of Wilmington in a case alleging Age Discrimination, Workers’ Compensation Retaliation, First Amendment Retaliation, and Due Process Clause violations. The case was affirmed by the Delaware Supreme Court.